Der Artikel Marty (Blu-ray & DVD) (UK Import) wurde in den Warenkorb gelegt. 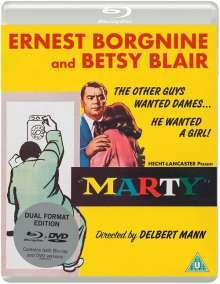 A beloved classic of American cinema, Delbert Mann’s Marty was the first ever recipient of the Palme d’Or at the 1955 Cannes Film Festival, as well as the winner of the Academy Award for Best Picture, one of only two films to ever win both organisations’ grand prizes (the second being Billy Wilder’s The Lost Weekend). “I’ve been looking for a girl every Saturday night of my life,” says Marty Piletti (Ernest Borgnine, The Vikings, Violent Saturday). Yet, despite all his efforts, this 34-year old Bronx butcher remains as shy and uncomfortable around women today as on the day he was born. So when he meets Clara (Betsy Blair, Il Grido), a lonely schoolteacher who’s just as smitten with him as he is with her, Marty’s on top of the world. But not everyone around him shares his joy. And when his friends and family continually find fault with Clara, even Marty begins to question his newfound love… until he discovers, in an extraordinary way, the strength and courage to follow his heart. Adapted from an earlier teleplay (also included with this release) written by renowned screenwriter Paddy Chayefsky (Network), Eureka Classics is proud to present Marty in a special Dual Format edition, that includes the film on Blu-ray for the first time in the UK. Lexikon des Int. Films: "Die Liebesgeschichte zwischen einem Fleischergesellen und einer unscheinbaren jungen Frau. Der mehrfach ausgezeichnete Film ist genau in der Milieuschilderung, psychologisch feinfühlig und hervorragend gespielt."